Illustration of a Cartesian coordinate plane. Four points are marked and labeled with their coordinates: (2, 3) in green, (−3, 1) in red, (−1.5, −2.5) in blue, and the origin (0, 0) in purple. A Cartesian coordinate system (UK: /kɑːˈtiːzjən/, US: /kɑːrˈtiʒən/) is a coordinate system that specifies each point uniquely in a plane by a set of numerical coordinates, which are the signed distances to the point from two fixed perpendicular oriented lines, measured in the same unit of length. Each reference line is called a coordinate axis or just axis (plural axes) of the system, and the point where they meet is its origin, at ordered pair (0, 0). The coordinates can also be defined as the positions of the perpendicular projections of the point onto the two axes, expressed as signed distances from the origin. One can use the same principle to specify the position of any point in three-dimensional space by three Cartesian coordinates, its signed distances to three mutually perpendicular planes (or, equivalently, by its perpendicular projection onto three mutually perpendicular lines). In general, n Cartesian coordinates (an element of real n-space) specify the point in an n-dimensional Euclidean space for any dimension n. These coordinates are equal, up to sign, to distances from the point to n mutually perpendicular hyperplanes. The invention of Cartesian coordinates in the 17th century by René Descartes (Latinized name: Cartesius) revolutionized mathematics by providing the first systematic link between Euclidean geometry and algebra. Using the Cartesian coordinate system, geometric shapes (such as curves) can be described by Cartesian equations: algebraic equations involving the coordinates of the points lying on the shape. For example, a circle of radius 2, centered at the origin of the plane, may be described as the set of all points whose coordinates x and y satisfy the equation x2 + y2 = 4. Cartesian coordinates are the foundation of analytic geometry, and provide enlightening geometric interpretations for many other branches of mathematics, such as linear algebra, complex analysis, differential geometry, multivariate calculus, group theory and more. A familiar example is the concept of the graph of a function. Cartesian coordinates are also essential tools for most applied disciplines that deal with geometry, including astronomy, physics, engineering and many more. They are the most common coordinate system used in computer graphics, computer-aided geometric design and other geometry-related data processing. The adjective Cartesian refers to the French mathematician and philosopher René Descartes, who published this idea in 1637. It was independently discovered by Pierre de Fermat, who also worked in three dimensions, although Fermat did not publish the discovery. The French cleric Nicole Oresme used constructions similar to Cartesian coordinates well before the time of Descartes and Fermat. Both Descartes and Fermat used a single axis in their treatments and have a variable length measured in reference to this axis. The concept of using a pair of axes was introduced later, after Descartes' La Géométrie was translated into Latin in 1649 by Frans van Schooten and his students. These commentators introduced several concepts while trying to clarify the ideas contained in Descartes' work. The development of the Cartesian coordinate system would play a fundamental role in the development of the calculus by Isaac Newton and Gottfried Wilhelm Leibniz. The two-coordinate description of the plane was later generalized into the concept of vector spaces. Choosing a Cartesian coordinate system for a one-dimensional space—that is, for a straight line—involves choosing a point O of the line (the origin), a unit of length, and an orientation for the line. An orientation chooses which of the two half-lines determined by O is the positive, and which is negative; we then say that the line "is oriented" (or "points") from the negative half towards the positive half. Then each point P of the line can be specified by its distance from O, taken with a + or − sign depending on which half-line contains P.
A line with a chosen Cartesian system is called a number line. Every real number has a unique location on the line. Conversely, every point on the line can be interpreted as a number in an ordered continuum such as the real numbers. A Cartesian coordinate system in two dimensions (also called a rectangular coordinate system or an orthogonal coordinate system) is defined by an ordered pair of perpendicular lines (axes), a single unit of length for both axes, and an orientation for each axis. The point where the axes meet is taken as the origin for both, thus turning each axis into a number line. For any point P, a line is drawn through P perpendicular to each axis, and the position where it meets the axis is interpreted as a number. The two numbers, in that chosen order, are the Cartesian coordinates of P. The reverse construction allows one to determine the point P given its coordinates. The first and second coordinates are called the abscissa and the ordinate of P, respectively; and the point where the axes meet is called the origin of the coordinate system. The coordinates are usually written as two numbers in parentheses, in that order, separated by a comma, as in (3, −10.5). Thus the origin has coordinates (0, 0), and the points on the positive half-axes, one unit away from the origin, have coordinates (1, 0) and (0, 1). In mathematics, physics, and engineering, the first axis is usually defined or depicted as horizontal and oriented to the right, and the second axis is vertical and oriented upwards. (However, in some computer graphics contexts, the ordinate axis may be oriented downwards.) The origin is often labeled O, and the two coordinates are often denoted by the letters X and Y, or x and y. The axes may then be referred to as the X-axis and Y-axis. The choices of letters come from the original convention, which is to use the latter part of the alphabet to indicate unknown values. The first part of the alphabet was used to designate known values. A Euclidean plane with a chosen Cartesian coordinate system is called a Cartesian plane. In a Cartesian plane one can define canonical representatives of certain geometric figures, such as the unit circle (with radius equal to the length unit, and center at the origin), the unit square (whose diagonal has endpoints at (0, 0) and (1, 1)), the unit hyperbola, and so on. The two axes divide the plane into four right angles, called quadrant. The quadrants may be named or numbered in various ways, but the quadrant where all coordinates are positive is usually called the first quadrant. If the coordinates of a point are (x, y), then its distances from the X-axis and from the Y-axis are |y| and |x|, respectively; where |...| denotes the absolute value of a number. A three dimensional Cartesian coordinate system, with origin O and axis lines X, Y and Z, oriented as shown by the arrows. The tick marks on the axes are one length unit apart. The black dot shows the point with coordinates x = 2, y = 3, and z = 4, or (2, 3, 4). A Cartesian coordinate system for a three-dimensional space consists of an ordered triplet of lines (the axes) that go through a common point (the origin), and are pair-wise perpendicular; a orientation for each axis; and a single unit of length for all three axes. As in the two-dimensional case, each axis becomes a number line. For any point P of space, one considers a plane through P perpendicular to each coordinate axis, and interprets the point where that plane cuts the axis as a number. The Cartesian coordinates of P are those three numbers, in the chosen order. The reverse construction determines the point P given its three coordinates. Alternatively, each coordinate of a point P can be taken as the distance from P to the plane defined by the other two axes, with the sign determined by the orientation of the corresponding axis. Each pair of axes defines a coordinate plane. These planes divide space into eight trihedra, called octants. The coordinates are usually written as three numbers (or algebraic formulas) surrounded by parentheses and separated by commas, as in (3, −2.5, 1) or (t, u + v, π/2). Thus, the origin has coordinates (0, 0, 0), and the unit points on the three axes are (1, 0, 0), (0, 1, 0), and (0, 0, 1). There are no standard names for the coordinates in the three axes (however, the terms abscissa, ordinate and applicate are sometimes used). The coordinates are often denoted by the letters X, Y, and Z, or x, y, and z. The axes may then be referred to as the X-axis, Y-axis, and Z-axis, respectively. Then the coordinate planes can be referred to as the XY-plane, YZ-plane, and XZ-plane. In mathematics, physics, and engineering contexts, the first two axes are often defined or depicted as horizontal, with the third axis pointing up. In that case the third coordinate may be called height or altitude. The orientation is usually chosen so that the 90 degree angle from the first axis to the second axis looks counter-clockwise when seen from the point (0, 0, 1); a convention that is commonly called the right hand rule. The coordinate surfaces of the Cartesian coordinates (x, y, z). The z-axis is vertical and the x-axis is highlighted in green. Thus, the red plane shows the points with x = 1, the blue plane shows the points with z = 1, and the yellow plane shows the points with y = −1. The three surfaces intersect at the point P (shown as a black sphere) with the Cartesian coordinates (1, −1, 1). The concept of Cartesian coordinates generalizes to allow axes that are not perpendicular to each other, and/or different units along each axis. In that case, each coordinate is obtained by projecting the point onto one axis along a direction that is parallel to the other axis (or, in general, to the hyperplane defined by all the other axes). In such an oblique coordinate system the computations of distances and angles must be modified from that in standard Cartesian systems, and many standard formulas (such as the Pythagorean formula for the distance) do not hold (see affine plane). The Cartesian coordinates of a point are usually written in parentheses and separated by commas, as in (10, 5) or (3, 5, 7). The origin is often labelled with the capital letter O. In analytic geometry, unknown or generic coordinates are often denoted by the letters (x, y) in the plane, and (x, y, z) in three-dimensional space. This custom comes from a convention of algebra, which uses letters near the end of the alphabet for unknown values (such as were the coordinates of points in many geometric problems), and letters near the beginning for given quantities. These conventional names are often used in other domains, such as physics and engineering, although other letters may be used. For example, in a graph showing how a pressure varies with time, the graph coordinates may be denoted p and t. Each axis is usually named after the coordinate which is measured along it; so one says the x-axis, the y-axis, the t-axis, etc. Another common convention for coordinate naming is to use subscripts, as (x1, x2, ..., xn) for the n coordinates in an n-dimensional space, especially when n is greater than 3 or unspecified. Some authors prefer the numbering (x0, x1, ..., xn−1). These notations are especially advantageous in computer programming: by storing the coordinates of a point as an array, instead of a record, the subscript can serve to index the coordinates. In mathematical illustrations of two-dimensional Cartesian systems, the first coordinate (traditionally called the abscissa) is measured along a horizontal axis, oriented from left to right. The second coordinate (the ordinate) is then measured along a vertical axis, usually oriented from bottom to top. Young children learning the Cartesian system, commonly learn the order to read the values before cementing the x-, y-, and z-axis concepts, by starting with 2D mnemonics (e.g. 'Walk along the hall then up the stairs' akin to straight across the x-axis then up vertically along the y-axis). Computer graphics and image processing, however, often use a coordinate system with the y-axis oriented downwards on the computer display. This convention developed in the 1960s (or earlier) from the way that images were originally stored in display buffers. 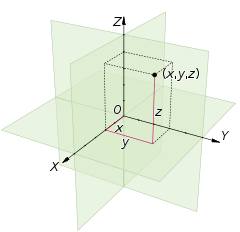 For three-dimensional systems, a convention is to portray the xy-plane horizontally, with the z-axis added to represent height (positive up). Furthermore, there is a convention to orient the x-axis toward the viewer, biased either to the right or left. If a diagram (3D projection or 2D perspective drawing) shows the x- and y-axis horizontally and vertically, respectively, then the z-axis should be shown pointing "out of the page" towards the viewer or camera. In such a 2D diagram of a 3D coordinate system, the z-axis would appear as a line or ray pointing down and to the left or down and to the right, depending on the presumed viewer or camera perspective. In any diagram or display, the orientation of the three axes, as a whole, is arbitrary. However, the orientation of the axes relative to each other should always comply with the right-hand rule, unless specifically stated otherwise. All laws of physics and math assume this right-handedness, which ensures consistency. 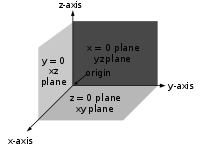 For 3D diagrams, the names "abscissa" and "ordinate" are rarely used for x and y, respectively. When they are, the z-coordinate is sometimes called the applicate. The words abscissa, ordinate and applicate are sometimes used to refer to coordinate axes rather than the coordinate values. 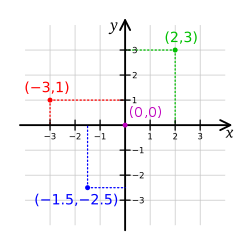 The axes of a two-dimensional Cartesian system divide the plane into four infinite regions, called quadrants, each bounded by two half-axes. These are often numbered from 1st to 4th and denoted by Roman numerals: I (where the signs of the two coordinates are I (+,+), II (−,+), III (−,−), and IV (+,−). When the axes are drawn according to the mathematical custom, the numbering goes counter-clockwise starting from the upper right ("north-east") quadrant. Similarly, a three-dimensional Cartesian system defines a division of space into eight regions or octants, according to the signs of the coordinates of the points. The convention used for naming a specific octant is to list its signs, e.g. (+ + +) or (− + −). The generalization of the quadrant and octant to an arbitrary number of dimensions is the orthant, and a similar naming system applies. which can be obtained by two consecutive applications of Pythagoras' theorem. The Euclidean transformations or Euclidean motions are the (bijective) mappings of points of the Euclidean plane to themselves which preserve distances between points. There are four types of these mappings (also called isometries): translations, rotations, reflections and glide reflections. A glide reflection is the composition of a reflection across a line followed by a translation in the direction of that line. It can be seen that the order of these operations does not matter (the translation can come first, followed by the reflection). This is equivalent to saying that A times its transpose must be the identity matrix. If these conditions do not hold, the formula describes a more general affine transformation of the plane provided that the determinant of A is not zero. Assuming that translation is not used transformations can be combined by simply multiplying the associated transformation matrices. Using affine transformations multiple different euclidean transformations including translation can be combined by simply multiplying the corresponding matrices. The usual way of orienting the plane, with the positive x-axis pointing right and the positive y-axis pointing up (and the x-axis being the "first" and the y-axis the "second" axis), is considered the positive or standard orientation, also called the right-handed orientation. A commonly used mnemonic for defining the positive orientation is the right-hand rule. Placing a somewhat closed right hand on the plane with the thumb pointing up, the fingers point from the x-axis to the y-axis, in a positively oriented coordinate system. The other way of orienting the plane is following the left hand rule, placing the left hand on the plane with the thumb pointing up. When pointing the thumb away from the origin along an axis towards positive, the curvature of the fingers indicates a positive rotation along that axis. Regardless of the rule used to orient the plane, rotating the coordinate system will preserve the orientation. Switching any two axes will reverse the orientation, but switching both will leave the orientation unchanged. Fig. 7 – The left-handed orientation is shown on the left, and the right-handed on the right. Fig. 8 – The right-handed Cartesian coordinate system indicating the coordinate planes. Once the x- and y-axes are specified, they determine the line along which the z-axis should lie, but there are two possible orientation for this line. The two possible coordinate systems which result are called 'right-handed' and 'left-handed'. The standard orientation, where the xy-plane is horizontal and the z-axis points up (and the x- and the y-axis form a positively oriented two-dimensional coordinate system in the xy-plane if observed from above the xy-plane) is called right-handed or positive. The name derives from the right-hand rule. If the index finger of the right hand is pointed forward, the middle finger bent inward at a right angle to it, and the thumb placed at a right angle to both, the three fingers indicate the relative orientation of the x-, y-, and z-axes in a right-handed system. The thumb indicates the x-axis, the index finger the y-axis and the middle finger the z-axis. Conversely, if the same is done with the left hand, a left-handed system results. 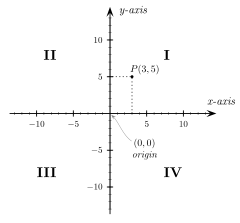 Figure 7 depicts a left and a right-handed coordinate system. Because a three-dimensional object is represented on the two-dimensional screen, distortion and ambiguity result. The axis pointing downward (and to the right) is also meant to point towards the observer, whereas the "middle"-axis is meant to point away from the observer. 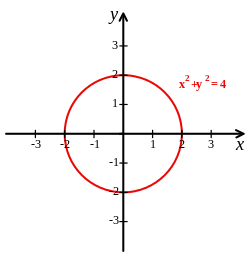 The red circle is parallel to the horizontal xy-plane and indicates rotation from the x-axis to the y-axis (in both cases). Hence the red arrow passes in front of the z-axis. Figure 8 is another attempt at depicting a right-handed coordinate system. Again, there is an ambiguity caused by projecting the three-dimensional coordinate system into the plane. Many observers see Figure 8 as "flipping in and out" between a convex cube and a concave "corner". This corresponds to the two possible orientations of the space. Seeing the figure as convex gives a left-handed coordinate system. Thus the "correct" way to view Figure 8 is to imagine the x-axis as pointing towards the observer and thus seeing a concave corner. is the unit vector in the direction of the z-axis. There is no natural interpretation of multiplying vectors to obtain another vector that works in all dimensions, however there is a way to use complex numbers to provide such a multiplication. In a two dimensional cartesian plane, identify the point with coordinates (x, y) with the complex number z = x + iy. Here, i is the imaginary unit and is identified with the point with coordinates (0, 1), so it is not the unit vector in the direction of the x-axis. Since the complex numbers can be multiplied giving another complex number, this identification provides a means to "multiply" vectors. In a three dimensional cartesian space a similar identification can be made with a subset of the quaternions. Cartesian coordinates are an abstraction that have a multitude of possible applications in the real world. However, three constructive steps are involved in superimposing coordinates on a problem application. 1) Units of distance must be decided defining the spatial size represented by the numbers used as coordinates. 2) An origin must be assigned to a specific spatial location or landmark, and 3) the orientation of the axes must be defined using available directional cues for all but one axis. Consider as an example superimposing 3D Cartesian coordinates over all points on the Earth (i.e. geospatial 3D). What units make sense? Kilometers are a good choice, since the original definition of the kilometer was geospatial...10 000 km equalling the surface distance from the Equator to the North Pole. Where to place the origin? Based on symmetry, the gravitational center of the Earth suggests a natural landmark (which can be sensed via satellite orbits). Finally, how to orient X-, Y- and Z-axis? The axis of Earth's spin provides a natural orientation strongly associated with "up vs. down", so positive Z can adopt the direction from geocenter to North Pole. A location on the Equator is needed to define the X-axis, and the prime meridian stands out as a reference orientation, so the X-axis takes the orientation from geocenter out to [ 0 degrees longitude, 0 degrees latitude ]. Note that with 3 dimensions, and two perpendicular axes orientations pinned down for X and Z, the Y-axis is determined by the first two choices. 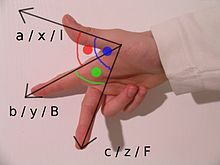 In order to obey the right-hand rule, the Y-axis must point out from the geocenter to [ 90 degrees longitude, 0 degrees latitude ]. So what are the geocentric coordinates of the Empire State Building in New York City? Using [ longitude = −73.985656, latitude = 40.748433 ], Earth radius = 40,000/2π, and transforming from spherical --> Cartesian coordinates, you can estimate the geocentric coordinates of the Empire State Building, [ x, y, z ] = [ 1330.53 km, –4635.75 km, 4155.46 km ]. GPS navigation relies on such geocentric coordinates. In engineering projects, agreement on the definition of coordinates is a crucial foundation. One cannot assume that coordinates come predefined for a novel application, so knowledge of how to erect a coordinate system where there is none is essential to applying René Descartes' ingenious thinking. While spatial apps employ identical units along all axes, in business and scientific apps, each axis may have different units of measurement associated with it (such as kilograms, seconds, pounds, etc.). Although four- and higher-dimensional spaces are difficult to visualize, the algebra of Cartesian coordinates can be extended relatively easily to four or more variables, so that certain calculations involving many variables can be done. (This sort of algebraic extension is what is used to define the geometry of higher-dimensional spaces.) Conversely, it is often helpful to use the geometry of Cartesian coordinates in two or three dimensions to visualize algebraic relationships between two or three of many non-spatial variables. The graph of a function or relation is the set of all points satisfying that function or relation. For a function of one variable, f, the set of all points (x, y), where y = f(x) is the graph of the function f. For a function g of two variables, the set of all points (x, y, z), where z = g(x, y) is the graph of the function g. A sketch of the graph of such a function or relation would consist of all the salient parts of the function or relation which would include its relative extrema, its concavity and points of inflection, any points of discontinuity and its end behavior. All of these terms are more fully defined in calculus. Such graphs are useful in calculus to understand the nature and behavior of a function or relation. ^ Bix, Robert A.; D'Souza, Harry J. "Analytic geometry". Encyclopædia Britannica. Retrieved 2017-08-06. ^ Kent, Alexander J.; Vujakovic, Peter (2017-10-04). The Routledge Handbook of Mapping and Cartography. Routledge. ISBN 9781317568216. ^ Axler, Sheldon (2015). Linear Algebra Done Right - Springer. Undergraduate Texts in Mathematics. p. 1. doi:10.1007/978-3-319-11080-6. ISBN 978-3-319-11079-0. ^ a b c d "Cartesian orthogonal coordinate system". Encyclopedia of Mathematics. Retrieved 2017-08-06. ^ "Charts and Graphs: Choosing the Right Format". www.mindtools.com. Retrieved 2017-08-29. ^ Hughes-Hallett, Deborah; McCallum, William G.; Gleason, Andrew M. (2013). Calculus : Single and Multivariable (6 ed.). John wiley. ISBN 978-0470-88861-2. ^ David J. Griffiths (1999). Introduction to Electrodynamics. Prentice Hall. ISBN 978-0-13-805326-0. Descartes, René (2001). Discourse on Method, Optics, Geometry, and Meteorology. Translated by Paul J. Oscamp (Revised ed.). Indianapolis, IN: Hackett Publishing. ISBN 978-0-87220-567-3. OCLC 488633510. Moon P, Spencer DE (1988). "Rectangular Coordinates (x, y, z)". Field Theory Handbook, Including Coordinate Systems, Differential Equations, and Their Solutions (corrected 2nd, 3rd print ed.). New York: Springer-Verlag. pp. 9–11 (Table 1.01). ISBN 978-0-387-18430-2.